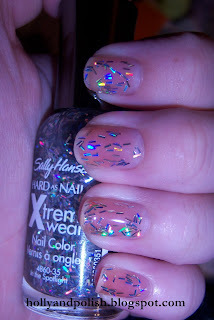 I really love glitter polishes that work good for layering, and when I had heard about In the Spotlight by Sally Hansen from the Xtreme Wear line awhile ago, I really wanted it. I couldn't find it anywhere for the longest time, so I was really excited to find it at Ulta this past weekend! In the Spotlight is a rectangle/bar shaped holographic glitter in a clear base. I had never had any bar shaped glitters before so I thought that this one would be fun. The glitter was a little hard to work with and get even, but I think it still looks good. I think this polish will be good for whenever I want to mix things up a little bit and don’t just want to wear one solid color.